Dazaifu Tenmangu is the largest Shinto shrine in Fukuoka, Kyushu. On its grounds, you’ll find both a peaceful and lively atmosphere, sweet Japanese treats, and beautiful nature each season. Read more about to find out about this special shrine. Dazaifu Tenmangu is one sightseeing spot the city of Fukuoka in Kyushu is famous for. At the end of a street lined with souvenir shops is a beautiful lake with a bridge stretched over it. The grandiose structure just ahead is the honden (main shrine), which gives off both a tranquil and lively air, often filled with visitors. It is also a popular location for ume (plum) flower-viewing. Visiting at the beginning of spring will leave you in awe of the countless sweet plum blossoms. This time we’ll take you to see the fascinating shrine of Dazaifu Tenmangu, introduce its special qualities, and how to enjoy your visit. The deity enshrined at Dazaifu Tenmangu is the god of academics, Sugawara no Michizane. Michizane was a respected scholar, politician, and a poet, who lived and worked around year 800-900. His scholarly talent was discovered in his early life and even went to receive a doctorate in literature, the highest title for a scholar of that time. However, he was falsely charged for a crime he didn’t commit and thus demoted, so he moved from Kyoto to Dazaifu, where he spent the rest of his life until his death. Michizane became the guardian deity of academics and is deeply respected and believed in by many. There are around 12000 Tenmangu shrines where it is believed Michizane is the deity throughout the country. Dazaifu Tenmangu is the head shrine of all these shrines. Even now, many students come to Dazaifu Tenmangu to pray for passing exams and for better grades. Now we will take a walk around Dazaifu Tenmangu! We introduce three spots visitors should pay attention to when visiting this shrine. After passing the entrance to the shrine grounds you will find an information area. First, get your hands on the map of the shrine grounds, but don’t forget to look towards the back of the room. You will discover a charming statue of an ox. There are around 10 statues of like this one around the Dazaifu Tenmangu grounds. When Sugawara no Michizane died, his disciple wanted to move his body using an ox carriage, but the ox wouldn’t move. “That must be Michizane’s wish”, thought the disciple, so he decided to bury him there instead. Later on, the people who respected Michizane and his works built a shrine (Dazaifu Tenmangu) where his remains are buried. This legend is the reason behind the many ox statues placed on the shrine grounds, meant to represent the goshingyu, or the sacred ox. It is believed that you can become smarter and expand your knowledge by patting the statue on the head. When you visit the shrine make sure to try it! As you enter the shrine grounds, you will see a lake with a bridge built over it. Observed from a bird’s-eye view, the lake forms a shape of “shin,” the Japanese character for "heart". Therefore, the lake has the name Shinjiike (Lake Shinji). The lake has three bridges leading to the shrine’s honden, one representing the past, one the present, and one the future. It is said that passing one of the bridges makes your body and soul into a purer state for meeting the deity of the shrine. After crossing the lake, you can see a chozuya on your right, a basin with wooden dippers found at shrines and temples, under the torii. Here you should wash off the impurities from your body and purify it before entering the shrine. This isn’t only characteristic of Dazaifu Tenmangu, as you should do this each time you visit a shrine in Japan. Let’s wash our hands and head to the honden. 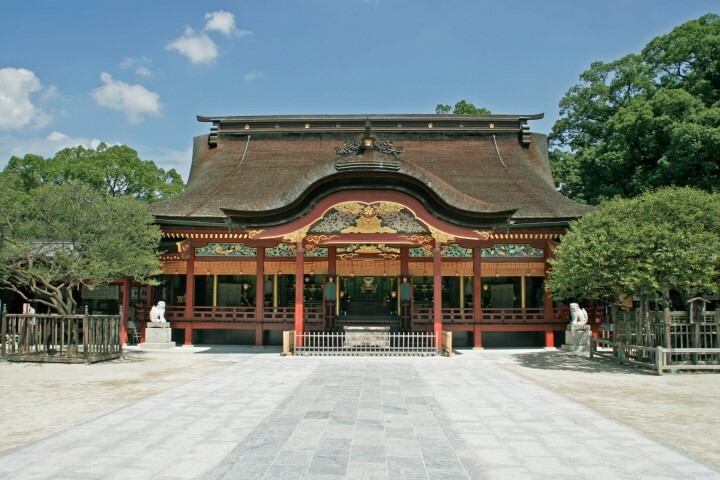 The crimson gate standing in front of the main hall, or honden, is called the romon. There is something special about the gate of Dazaifu. Here each side of the gate, including the frontside facing the lake, and the back which faces the honden, is different. When looked upon from the lakeside, you can notice two roofs on the gate, but the honden side only has one. Take a look at it yourself, and admire this wonderful building on your walk to the honden. Finally, you will reach the honden after passing the romon. The honden was built in a special place, completely surrounded by a cloister. The honden was first constructed in 919, after which it suffered great damage in several fires. It was rebuilt in 1591 as the version we know of and can admire today. It has survived more than 400 years, and stands as elegant and impressive as ever, thus deserving its place on the list of Japan’s Important Cultural Property. On the grounds of Dazaifu Tenmangu, you’ll recognize many buildings and facilities of historical and artistic value, as well. One such facility is Homotsuden, or repository for treasure. At the Homotsuden there are more than 50 thousand valuable items and documents related to Sugawara no Michizane are stored and displayed. Another interesting site is located only 5 minutes by foot from the shrine. The Kyushu National Museum is a place to admire exhibits from not only Japan, but also exhibits showing the international exchange with Asian and European countries. Special exhibitions and events related to art are also held here. If you’ll be visiting Dazaifu Tenmangu during February or March, consider yourself lucky! This shrine is well-known for its beautiful ume (plum) blossoms. The season starts at the end of January and lasts until the end of March. It is widely known that Sugawara no Michizane loved plum flowers very much, thus the legend that, when he was demoted and moved to Dazaifu, the plum trees that Michizane very much loved followed him from Kyoto. The plum trees in Dazaifu Tenmangu are believed to be the same trees from the legend, are called tobiume. There are also other reasons to visit Dazaifu Tenmangu in the ume (plum)-blooming season – there are around 6000 trees of around 200 species of the plum tree, so the visitors can enjoy the splendor of both fragrant plum scent and gorgeous plum blossoms. The plum tree usually blossoms earlier than sakura (cherry) tree, when the temperature is still a little chilly. Our advice is to wear something warm when going to enjoy plum blossom-viewing. In addition to plum trees, cherry trees bloom from the end of March until the beginning of April, and you can also gaze upon the autumn foliage from the middle of November until the beginning of December. Each season you will encounter a different side of nature in the surrounding area. If you decide to pay Dazaifu a visit, there is also one dish we wouldn’t want you to miss for the world. Be sure to try the shrine’s famous umegaemochi. Although this item contains the word “ume”, there isn’t umeboshi (pickled plum) in it. This mochi is also connected to Sugawara no Michizane. According to legend, when Michizane came to this shrine he met many hardships and led a tough life. Due to this, one day an elderly lady wrapped a mochi cake in a plum twig and gave it to him. Umegaemochi at Dazaifu became well-known from this story. It is quite a simple dessert, with red bean paste inside the mochi. The crispy outer layer of mochi combined with the chewy filling makes it a plain-seeming but irresistible dessert. It would be hard to eat just one of these! In order to reach Dazaifu Tenmangu, visitors should follow the sando (path). On both sides of 200-meter long sando there are many souvenir shops and cafes, so visitors can treat themselves to delicious umegaemochi while walking the path. You may also stumble upon a unique and modern Starbucks café, designed by the respected Japanese architect Kengo Kuma. Search for souvenirs and enjoy a nice snack while following the sando to the shrine. Most visitors at Dazaifu are from Hakata. If you are heading from that area, the station nearest to Dazaifu Tenmangu is Dazaifu Station. You should ride the direct line to the shrine from Hakata bus terminal (a five-minute walk at Hakata Station). You’ll need around 45 minutes and 600 yen. When going by train, ride the train of Tenjin-Oomuta Line from Nishitetsu Fukuoka Station in the Hakata-Tenjin area for 15 minutes. After arriving at Futsukaichi Station, change to Dazaifu Line train, and you should arrive at Dazaifu Station after approximately 5 minutes (400 yen). Dazaifu Tenmangu is not an ordinary shrine or just another place to buy souvenirs. Here visitors can enjoy each seasons and changing nature. It is a location not to miss, so be sure to pay it a visit next time you head for Kyushu and Fukuoka. This is a rewritten version of an article published on October 28, 2015.